The Queen of Pentacles in a Tarot reading represents a woman who is financially well off and will be generous towards you, it could be a rich and happy relationship offering financial and emotional security. In the reversed position she is not someone who you can trust and can be changeable and nasty with the intent to do you deliberate harm. The face suggests that of a dark woman, whose qualities might be summed up in the idea of greatness of soul; she has also the serious cast of intelligence; she contemplates her symbol and may see worlds therein. Opulence, generosity, magnificence, security, liberty. Evil, suspicion, suspense, fear, mistrust. Dark woman; presents from a rich relative; rich and happy marriage for a young man. 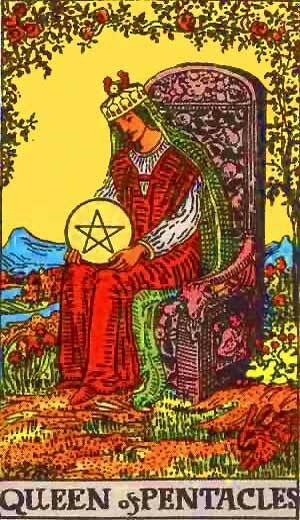 Queen of Pentacles – A dark Woman, a generous Woman, Liberality, Greatness of Soul, Generosity. Certain Evil, a suspicious Woman, a Woman justly regarded with Suspicion, Doubt, Mistrust. Dark woman, who suggests “the idea of greatness of soul; she has also the serious cast of intelligence.” (Waite) Opulence, riches, luxury, assurance (insurance? ), security, liberty, frankness. Reversed: Doubt, indecision, uncertainty, timidity, apprehension, vacillation, etc. The higher octave of the two, consequently covering the Sixth house and demonstrating the features of the noble Virgo-type. So this must be a woman always inclined to help and to serve, to make herself useful, a nurse perhaps, a household woman of good standing a good hostess. There are also qualities of science in this house, as it is the house of the Academy and Minerva. So she may be as an incarnation of Minerva herself, protecting science and craftsmanship as the Dame of Wands protects the arts. She must have many qualities and above all refinement, though she may suffer more or less from the evil–so far as it can be called–of doubt, and the difficulty of choosing between many possibilities in her nature. She is generous and benefic. Her presence is a good augury and she brings always protection and material wealth or at least well-being, ruling this house of earth. There may be some timidity; there is always honesty, honourable action, correctness and the right attitude to all problems of life, discretion, education, understanding, knowledge. These qualities certainly engender security in life. The visica piscis on the cube corresponds to the letter H of IHVH. From beginning of last decanate of Aries to end of second decanate of Taurus, from April 10th to May 9th. This period is under the rulerships of Jupiter, Venus and Mercury. A generous, somewhat ceremonious, great-hearted, charming, and graceful woman. Probably possessed of considerable means, and friendly to Querant. Ostentatious, not too nice in morals, capricious, changeable, superficial. Likely to do Querant harm through foolish talk, exposure of his plans, etc. Dark hair and dark eyes. More information on the Queen of Pentacles Tarot card. This entry was posted in Tarot, Runes and Divination and tagged dark woman, earth, feelings, love, marriage and divorce, mercury, queen of pentacles, science, stress, tarot. Bookmark the permalink.